Metro has announced plans to test new fare payment options that could make your trip through Metro station fare gates quicker and easier. 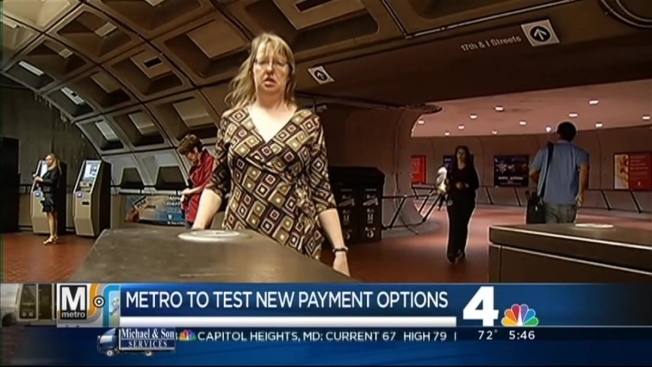 Metro says the new payment options would allow riders to pay for their trip with their next-generation smartphones, NFC-enabled watches, contactless credit and debit cards and Federal identification cards. The pilot program will roll out at 10 Metro stations, six Metrobus routes and two parking facilities in January. The new fare gates will be installed next month. The 10 Metrorail testing station will include: Shady Grove, Eisenhower Avenue, Bethesda, Pentagon City, Pentagon, Ballston, Gallery Place, Farragut West, Navy Yard and Suitland. The parking facilities at Shady Grove and Suitland will also be included in the pilot. The six Metrobus routes selected for testing are: 37 (Wisconsin Ave Limited), X9 (Benning Rd-H St Limited), 39 (Pennsylvania Ave Limited), K9 (New Hampshire Ave Limited), J4 (College Park-Bethesda Limited), and REX (Richmond Highway Express). Metro will begin recruiting customers to participate in the pilot program in the next few weeks. If the program is successful, Metro plans to replace the old fare gates and fare card vending machines beginning in 2017.